I would imagine there has been more written in the past week about Harper Lee than she herself has written. 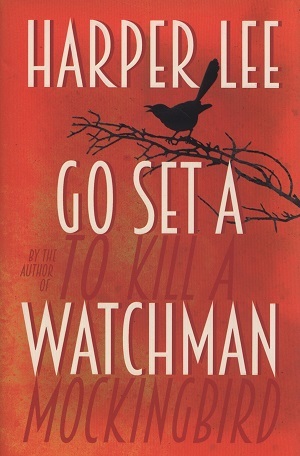 Apparently, just published Go Set a Watchman by Harper Lee is a ‘first draft’ of To Kill a Mockingbird – an unedited manuscript that was initially rejected for publication in its original format and then transformed (in conjunction with an editor) into To Kill a Mockingbird. This, and the reception of the book have raised some intriguing points. Firstly, whereas Mockingbird can be read as one of the pre-emptive Young Adult novels, Go Set a Watchman is more adult in tone. That’s such a positive message – that an editor chose to work with an author to change a novel intended for the mainstream adult audience to one told from a child’s point of view – and one that has become a studied text for teenagers world over. Secondly, many reviewers have reacted to the perceived racism of Atticus Finch in Go Set a Watchman, a character whose reputation had, from Mockingbird, been whiter than white. (Excuse the pun). Hadley Freeman wrote an interesting article in The Guardian this week, most of which I agree with, about the reviews of Go Set a Watchman. And yet, at the end, she rails against the ‘absurdly immature attitude’ that Lee’s books are hers, not ours. But this is where I disagree with Hadley. Once the writer has published their text, it does become the reader’s, not the writer’s. That is the beauty of literature, poetry, all art set down and shown to someone else. It’s a subjective thing – I see what I see in the text, which is totally different to that which another person sees. My Atticus is different from Hadley’s, each in turn different from Harper Lee’s. That is why so many film adaptations of books are so disappointing, so argued with. Leonardo DiCaprio is not, and can never rival the Gatsby in my head. In fact this is where the public consciousness of Atticus Finch may have been slightly altered – by the cultural influence of Gregory Peck playing Atticus Finch in the film. Each reader brings their own life experiences, memories, knowledge to each individual text. For every book that a reader reads, they go beyond the text on the page – they create an image out of the textual framework given to them. In the simplest example of this, Alice in Wonderland and Gulliver’s Travels can be read as hard-hitting political satire – or simply great children’s adventure stories. Neither interpretation is diminished by not understanding the other, it’s just a different way of reading and enjoying the text. Our collective image of pirates is borne out of Stevenson’s portrait of Long John Silver in Treasure Island, but I think if you went back to the original text you’d see that his portrait is much more ferocious and less comedic than you’d expect. Pirates in children’s literature now are comical, even witless, figures, although hugely likeable (for the most part), with stereotypical wooden legs, parrots on their shoulders, and a penchant for rum. In Treasure Island, Long John Silver is menacing, duplicitous, and quick-thinking. He’s the only person Flint has ever truly been afraid of. He is one of the darkest and most courageous characters in children’s literature. Likewise our collective consciousness of Peter Pan and Tinkerbell is quite different from the book. Whereas the Tinkerbell in our collective consciousness is a lovely, mischievous character flittering round the room like a light, in the original text she manipulates the Lost Boys to shoot Wendy. She’s jealous, and conniving, and pretty unpleasant. Even Peter Pan is quite vicious in intent and character in JM Barrie’s story. With a straightforward story, such as Mockingbird, the reason it has lived on as a classic in our schools and consciousness is that it can be argued over and interpreted in different ways. Could you read it simply as a coming-of-age story with Scout’s inherent tongue-in-cheek humour, or as a black and white discussion of morality and race, or both? If there was no interpretation, then regurgitating the Letts’ Study Aids would ensure that every student got an A* on their Mockingbird exam. Atticus existed in many different guises in Harper Lee’s imagination – morphing as she changed her text, re-writing, re-drafting and re-editing – as all writers do. Some writers speak of characters dictating the book to them, rather than the other way around – imagination is a complicated thing. So I’m not upset that Atticus becomes more ambiguous in Go Set a Watchman, less a perfect model of reason and courage, of truth and fairness, than he was in Mockingbird. Characters change in an author’s head all the time, and can be moulded to fit a story or plot too, or even killed off in the first chapter! But now that both versions are with the reader, we still own Atticus. We decide which version we want, how we read the text, how we reconcile the changes in the dynamic that have been presented to us, how we bring our own interpretation to it. Our view may get adjusted by a new text from the author – our Harry Potter of The Philosopher’s Stone is not exactly the same as our Harry Potter of the Deathly Hallows, but we, as readers, just continue to adjust each version presented to us to the one we have in our heads – adding in the new experiences, new adventures. We do it with people we know in real life all the time. After all a book is like a person – you have to climb into the text and feel it before you really understand it. “First of all,” he said, “if you can learn a simple trick, Scout, you’ll get along a lot better with all kinds of folks. You never really understand a person until you consider things from his point of view…until you climb into his skin and walk around in it.” Atticus to Scout, To Kill a Mockingbird. You have probably already bought Go Set a Watchman, and read To Kill a Mockingbird at school, but if you haven’t, then you can buy them here.